ECOLEX is a database of international environmental legal information, including treaties, court decisions, legislation and literature, operated jointly by the Food an Agriculture Organization (FAO), the UN Environmental Programme (UNEP) and the International Union for Conservation of Nature (IUCN). InforMEA (UN Information Portal on Multilateral Environmental Agreements) provides information on Conference of the Parties (COP) decisions and resolutions, news, events, Multilateral Environmental Agreements (MEA) membership, national focal points, national reports, and implementation plans from MEA secretariats. Semantic standard for institutions and organizations collecting and managing data, information and knowledge in the field of environmental Law and Governance. The Library's catalogue, UNBISnet, provides subject access to United Nations documents and publications on environmental issues. UNBISnet provides links to the full text of recent documentation. Subject terms which might prove useful in conducting a search are: sustainable development; forests; biological diversity; environment; development; oceans; law of the sea; marine resources; climate change; ozone-depleting substances; acid rain; developing island countries; renewable energy sources; etc. Proper names (e.g., UN Forum on Forests; Convention on the International Trade in Endangered Species of Wild Fauna and Flora) may also be used for constructing subject searches. The thesaurus may be used to identify additional descriptors. 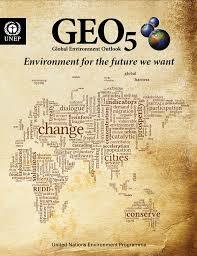 The Global Environment Outlook is a major publication for all those who are interested in environmental issues. It has brought together thousands of scientists and hundreds of collaborating centres. 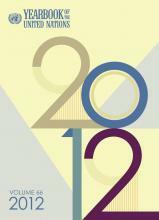 Highlight emerging environmental issues and significant events and development during the year. It also tracks environmental trends by presenting key indicators.